Product code: ES6707 Categories: Antique, Antique Brooch. This incredible 19th century antique cornucopia brooch is nothing short of breathtaking from its design, size, age and amount of incredible quality natural gemstones. The cornucopia motif, also known as the horn of plenty dates as far back as the 5th Century BC with two main storied behind the meaning of how the cornucopia design started – see below images for additional information on the cornucopia. 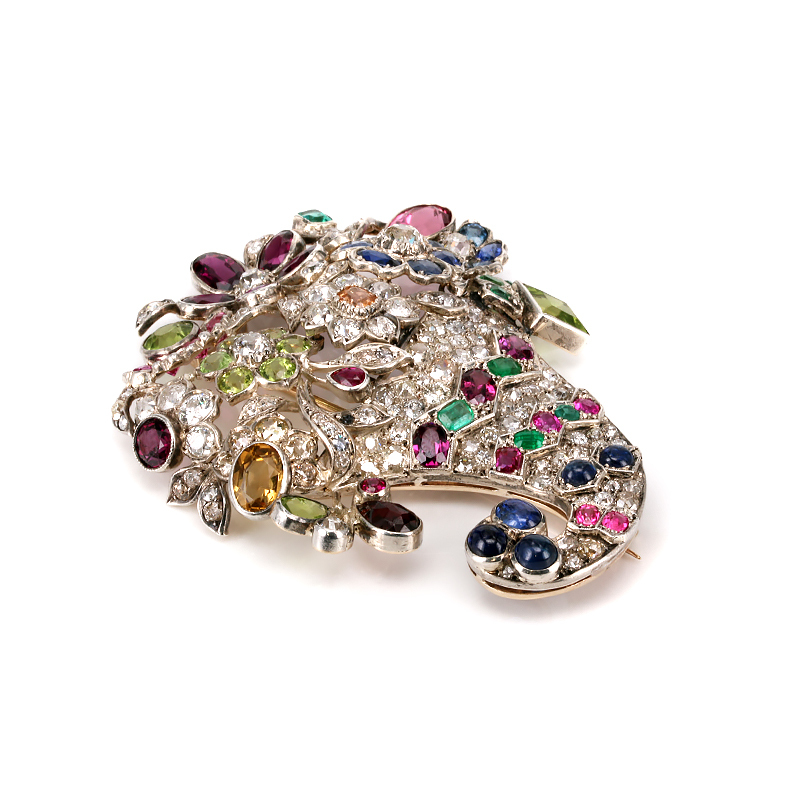 And this cornucopia gem encrusted brooch is nothing short of spectacular. Hand made in 15ct gold and silver, silver was used on the top as white gold was not yet invented when this brooch was made and platinum, although already discovered, was not used in jewellery until the early 1900’s. When you look closely at this brooch, it isn’t just a matter of gemstones being randomly placed, rather the top section is all made with a floral theme to it. From the peridot “flower”, there is also a sapphire flower, garnet and diamond flower. This brooch measures an astonishing 7.2cm by 5.5cm and certainly makes a statement in its own right at that size, however there are not only diamonds set into this brooch, but peridots, pink, blue and orange/peach coloured sapphires, garnets, emeralds, rubies and a tourmaline. In total there are 25 sapphires that total 6.06 carats, 4 emeralds 0.78 carats, 9 peridots that total 5 carats and 12 garnets that total 8.42 carats, 1 0.26 carat tourmaline, 4 emeralds that total 0.78 carats and finally 135 diamonds that total an incredible 13.85 carats. These gemstones are of the finest quality and the amount of labour and time in amassing all of these gemstones alone would have taken an incredible amount of time. And then to painstakingly hand make the brooch would have taken hours upon hours leading into days into days and weeks of work. Whether you wear brooches or not, there is no denying that this is one of the most incredible antique brooches around, and combined with its size, sentiment and incredible amount of gemstones, this is one extraordinary brooch that truly is a one-off. Incredible 19th century antique cornucopia brooch. There are two legends associated with the cornucopia which is also known as the “Horn of Plenty” that dates back to 5th century B.C. Greek mythology writes that Amalthea was a goat who nursed and raised Zeus from an infant, while in hiding from his father, Cronos, up in the mountains of Crete. She nursed him with her milk and ensured his safety in order for him to one day become a powerful god. One day, while playing around, Zeus accidentally broke one of Amalthea’s horns. In his remorse, he decided to repay her by using his godly powers to ensure the horn to be always filled with whatever Amalthea wished – eternal abundance. Hence the coining of the symbolic Horn of Plenty or cornucopia. This version of the myth tells of Hercules who is the son of the Greek god Zeus, who finds himself in a battle with Achelous, god of the river, to win the heart of Deianira, a beautiful maiden and the daughter of King Aeneus. According to legend, Achelous transformed himself into several creatures during the battle as part of his strategy to beat Hercules. As he was being held to the ground, he transformed himself first into a serpent, then a bull. Hercules, however, overtook him and eventually broke off one of his horns. Achelous then turned back into his god-like form, and returned to the river, therefore being defeated by Hercules. The beautiful maiden Deianira and Hercules kept the horn of Achelous and filled it with fruits and flowers to be presented in celebration of their marriage. There is a slightly different version that depicts how Hercules was Zeus’s son and therefore owner of Amalthea’s Horn of Plenty, and after battle with Achelous and feeling guilty for breaking off his horn, he gave him the Horn of Amalthea as a peace-offering.